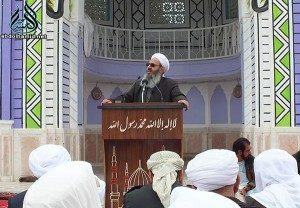 Pointing out to the ongoing crises and various kinds of problems in Iran, Khateeb of Sunnis urged on two pivots of “obtaining divine support” and “people’s sympathy” in order to get rid of the ongoing crises. “Before reinstatement of sanctions, only the news of sanctions created disorders in our markets and aggravated the economic problems,” he added more. “I think negotiation with the US is not a complete resolution, rather I believe the only remedy is to negotiate with the Iranian nation first of all; obtaining the satisfaction of the Almighty and ensuring people’s demands pave the way for resolving the crises,” he underlined. “Negotiations with others including the US can be productive and fruitful only in the case when the authorities and establishment have the support of Allah and people. Otherwise, even negotiation with the US cannot save us,” he clearly said. “The officials should get pleasure of people and listen to people. The legal and due demands of people should be heard and focused. None of authorities, Ulama, parts of the establishment and individuals is innocent. All Muslim rulers and personalities should act on Shari’ah and listen to their masses,” he added more. In another part of his speech, Shaikh Abdol-Hamid urged on revising policies of employing and approving competence of candidates. “Therefore, we see incompetent and weak managers and officials whose behavior erupted strikes and protests in the country,” Shaikh added more. “The country suffers from economic corruption. Economic problems cannot be resolved only by punishment of some corruptors; strategies and policies should be revised. This is the time to release political prisoners and take advantage of their viewpoints for resolving the national problems; intellectuals are not restricted to the governing body,” Shaikh added more. He expressed his deep regret on forbidding Sunni citizens in some metropolises, including Tehran from establishing Eid prayers. He termed such acts against the well of the higher officials. As well as, he recommended people to pursue their demands and problems peacefully without giving any chance to enemies for exacerbating the condition.